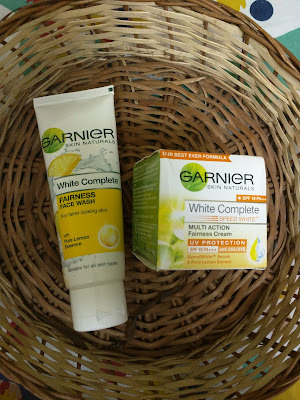 A couple of weeks back I registered myself for Garnier India's #7DayGarnierChallenge. Upon registering, they ship across a sample of the face wash and cream. How to get one tone fairer in one wash? Get 3 tones fairer skin, in just 7 days! The face wash has a creamy luxurious feel to it, and lathers well. It is pleasantly different from the face washes that make your face feel dry after using it. It is really applicable for all skin types, since I have a combination skin and I did not have any extra oiliness or breakouts after using this product. They're very clear about not using these products near the eyes, must be a good reason for that. My only hesitation here would be that since this range will make my skin tone fairer, wont my under-eyes look darker because I don't use the products there? I guess I have to use the under-eye roll-on they have for the same. The multi-action cream is to be applied right after washing and pat-drying your face. It is very light in texture, does not feel heavy at all and absorbs in the skin pretty fast. Again, it is not to be used around the eyes. Believe it or not, there was a very visible difference in my complexion in just 7 days. I'm not sure about 3 tones, but my skin was definitely 1-2 tones lighter, and even dark spots thanks to past acne issues and break-outs got lighter! This really is a wonder product. I am definitely going to continue using this product! They do have more products in the range - a night cream, eye roll on, 3 in 1 fairness facial and a face scrub. Might buy the roll-on soon, because under eye region is getting darker thanks to lack of sleep, the side effects of being a mom to an infant. You can take the challenge too! 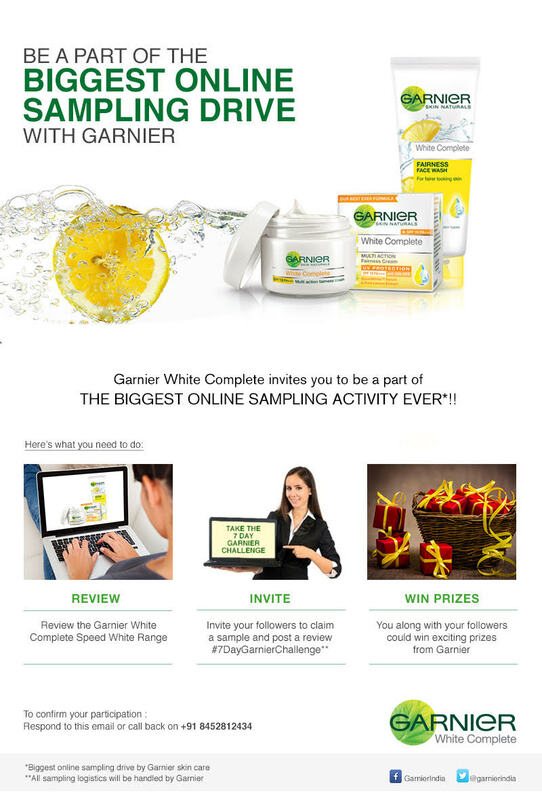 Simply register here and wait for your samples. Also, don't forget to follow Garnier India on Facebook & Twitter for the latest updates! One trip I'm waiting to take - Dazzling Dubai! A balanced diet or a crash diet?